Celebrating the life of Floyd Gassett Jr.
Obituary for Floyd Gassett Jr.
Floyd Gassett Jr., age 84, passed away Sunday June 3, 2018 at the Compassionate Care Center in Richmond, Ky. He was born August 17, 1933 in Madison County to the late Floyd Gassett Sr. and Hilda Mundy Gassett. Floyd was known as a talented wood carver. Floyd loved being outdoors working in the yard or mostly tending to his garden. 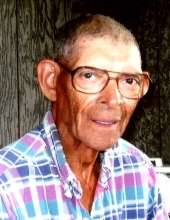 Floyd was a carpenter and was retired from Eastern Kentucky University. Floyd was of the Baptist faith. Floyd is survived by three children, Lisa Jane Gassett of Lexington, Ky., Tina Louise Gassett of Richmond, Ky., Donald Wayne Gassett Of Memphis, Tn., six grandchildren, Teveas Williams, Marcis Williams, Jeremy Jarmon, Tara Gassett, Taylor Gassett, Jaret Gassett, and three great grandchildren. Floyd is also survived by his children’s mother Mary Gassett Campbell. Other than his parents Floyd is preceded in death by three brothers, Thomas Gassett, Virgil Gassett, Wilbur Gassett, and two sisters, Thelma Simms, and Laura Louise Hopson. To send flowers or a remembrance gift to the family of Floyd Gassett Jr., please visit our Tribute Store. "Email Address" would like to share the life celebration of Floyd Gassett Jr.. Click on the "link" to go to share a favorite memory or leave a condolence message for the family.